Home Costs > How Much Do Caesarstone Countertops Cost? 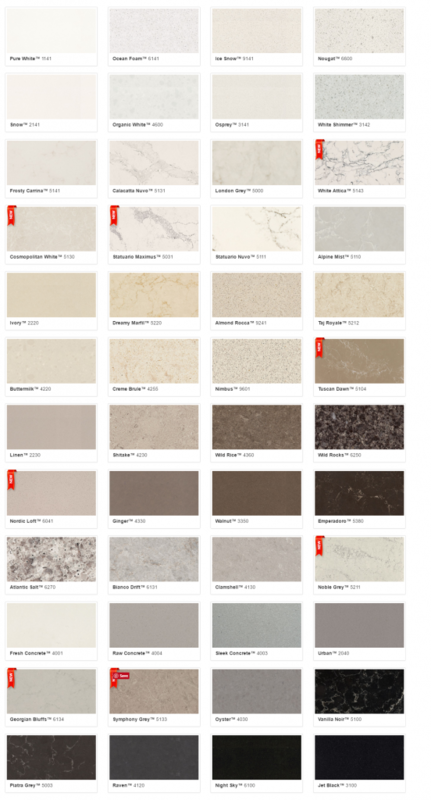 Caesarstone countertops generally aren’t a name you hear come up when you search for countertop material. Caesarstone originally came from Israel and has become one of the largest quartz-based countertop surfaces in the world. It is a manufactured quartz material that’s considered low maintenance and can come in hundreds of colors. On average, Caesarstone is going to cost anywhere from $20 to as much as $35 per square foot. This won’t include installation. The costs will depend on the quality, colors and where you purchase it from. Using these numbers, a 50 square foot countertop could cost $1,000, while a 75 square foot countertop could start at $1,500. When you factor in the professionals, plan on spending $60 to $100 per square foot to have it installed. This is a wide range since it will depend on the variation, availability, the type, installer and geographical location. One forum member on Gardenweb.com received a quote for $70 per square foot and an additional $200 for the sink cut out. Another member was quoted $75 per square foot for a polished piece. Caesarstone will come in four different grades: A, B, C and D. Each grade will refer to the color and pattern, not the quality. These grades can affect the total price. This counter, as noted above, is from Israel and is made up of about 93 percent quartz. The rest of the material is mixed with polymer resins and pigments to design the texture and colors. During the process, the colors and resins are mixed and poured into a mold. It will then be heated at about 190 degrees Fahrenheit and tested with 100 tons of pressure. The average thickness is between 3/4 inches and 1 1/4 inches. It can be thicker, but it will come at a higher price tag. Most of these counters will have a simple edge, but other edges may include a round, fancy ogee, elegant bevel or the utilitarian square edge. As for colors, the company offers 40 classic colors and multiple texture stone options. Depending on where the countertop is purchased, some may include the pre-cut measurements while others may just include the slab. Caesarstone can be formed into virtually any shape. Common finishes may include a glossy or matte finish. Some companies hold specials where they include a free sink if you choose their installation package. Some companies may also include free installation. If a professional contractor is chosen for the installation job, the kitchen countertops will be measured, cut at the factory and hand delivered. Once delivered, these countertops will be installed. This entire process can take up to two weeks. NOTE: The colors came from the official website collection. Most companies won’t fabricate or include the installation. Most labor will start $100 and go up depending on the size of the job. If older countertops have to be removed and disposed of, additional fees may apply, depending on the package chosen. Other costs, depending on the contractor, may include leveling, edge fabrication, cut-outs and seam jointing. Each contractor will have their own billing policy, so be sure to pay close attention to the contract before committing. A backsplash, if considered, will be considered an additional cost. If you’re unsure of how to install countertops, it’s wise to highly consider a professional installer. Check with the local BBB or ask friends and families for referrals. Be sure to consider other grades of countertops as the quality and pricing is going to vary. Many home and bath showrooms have books and hundreds of samples. This is a great way to touch and feel what the countertops would feel and look like as if it were installed in your home. To make it a quick estimate on your own, measure your countertops length by width in inches. By multiplying, this will give you the total square footage. It’s higher in terms of heat resistant. Each slab you receive will be unique. It will cost less than Caesarstone. Prone to staining if left too long on the surface. It will have to be sealed annually to prevent it from losing its color. You won’t have to reseal it. It can resist stains and can be used with other cleaners. It comes in a lot of colors and patterns. It can look similar to other countertops. Due to its process, it can be costly. Consider using sites such as Home Advisor to gather quotes from contractors in your area. Here, you input your information and contractors will email. Major retailers hold sales all the time. Take advantage of special promotions or considering signing up for an e-mail newsletter to stay in the loop. Countertop-based manufacturers commonly have deals that include free installation and free sinks. Most contractors are more than happy to offer you a quote for free. Try to make it a habit to get at least three quotes before proceeding. Suppliers will often have Caesarstone samples for you to take home. Take advantage of this to see how this color would match up to your kitchen or bathroom’s theme.